Image: Jemal Countess/Staff/Getty Images News. If you're part of the LGBTQ community or an ally, you’ve probably sported your rainbow tank top, sang your heart out at marches and voted for politicians who support equality. And sure, you may not be quite as epic an activist post-kids, but hey — now you have a whole posse of tiny activists to help you lead the revolution. How do you come up with kid-friendly ways to discuss the importance of equality, intersectionality and how to be an ally to humans of all genders and sexual orientations? We asked experts for advice on how to start the discussion early, encourage kids to participate and be vocal, and hopefully inspire a whole new generation of activism. Why is it important to encourage activism and allyship? Even if your toddler is at the age where he or she automatically says no to everything or your 7-year-old has decided you're no longer a "cool" parent, you always make an impact. And the more you express your beliefs and share why it's important to support others, no matter what sets us apart, the more you're doing your part as an ally. "Teaching our kids to embrace their own and others' differences, whether that be race, learning style or orientation, will give them greater assurance they too should feel accepted, regardless of how they develop," explains Stacy Pulice, Ph.D., a therapist and Education Ambassador for AHA! "Gender and sexual orientation are among the many ways people are discriminated against, and research proves that education and familiarity increases tolerance." And though you might not yet see indicators of your own child's gender identity or sexual orientation, Pulice notes that the population of adults who identify as LGBTQ has grown significantly in the past five years, with millennials beings almost twice as likely to identify as queer or non-cisgendered. This means the chances of your child being part of (or at least having a best friend who is part of) the LGBTQ community is highly likely. Pulice says it's never too early to help your children navigate the sometimes confusing topics of gender and sexuality. "Until around age 3, girls and boys are androgynous, or gender fluid, able to play and 'try on' gendered roles and dress without needing to choose," she explains. "Allowing them to experiment and accept the easy movement of a boy playing a princess or a girl playing a cowboy without reacting is important. Follow their lead, and if they ask why-questions, help them appreciate people for who they are." Apart from making sure kids know they're accepted no matter how they identify, Pulice adds that being a parent who is outwardly a proponent of human rights will help nurture a compassionate, inclusive adult. "We raise better human beings when we help them understand that the skin suits we wear and the identities we label ourselves with are mortal wrapping around the same universal need to be loved and to have belonging," she says. "Kids easily understand this and need this idea to be supported in a world that starts to teach discrimination." When are kids most impressionable? Pulice explains that the period between age 4 and the start of puberty is considered a "latent period," when children begin to build their sense of self and recognize their identity. "Your kids will venture into the world, being exposed to cultural norms that dictate gender and sexual orientation based on assigned gender at birth. This is a time when stereotyping can start, limiting options for choice," she explains. "The good news is that your children pick up your beliefs and attitudes at home, so familiarize yourself with the issues and vocabulary of gender and sexual orientation. Keeping open conversation is crucial if you hope to cultivate future activists." How do you approach the topic with care? Let’s be real: There's a lot of ground to cover when you want to talk to your child about what "LGBTQ" means, why it's worth a discussion and why it's crucial to accept all identities. But if you go into information overload, you know what will happen: Your kids will tune you out. That’s why Pulice says being mindful of how much your children can digest will help you determine what you'll say, how you'll say it and when to open up the discussions. "Discuss and rehearse with your co-parent or adult friends how you'd like to discuss the issue," she advises. "Your level of comfort with the subject is key, but know it can be a gradual process of educating. The basic message is that everyone deserves to feel safe and welcome and know that they belong. Parents need to keep in mind that they come in with many more narrow and formed opinions due to socialization than kids do. Parents need to work on their own filters and recognize places they are biased or fearful. The best way to approach kids is to ask them how they feel or think about these issues." Instead of just telling, showing your kids how many others support the LGBTQ community and demonstrating how their actions can enact change will help them better understand the importance of being an activist. 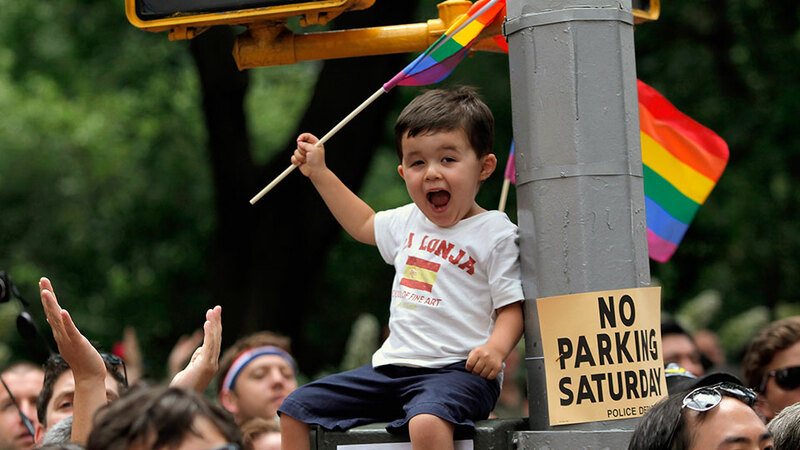 Daniel S. Sokal, a psychotherapist and parent-child relationship expert, recommends finding an organization, either nationally or locally, that welcomes families with kids of all ages, such as Parents and Friends of Lesbians and Gays and Genders and Sexualities Alliance Network. Another avenue Sokal suggests exploring is encouraging your kids to write to politicians in their community and explain how laws can hurt those who are discriminated against. After all, that's a powerful form of activism you can all do right at home.